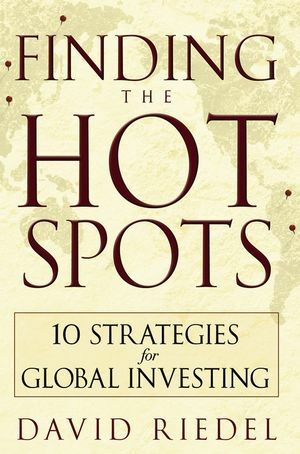 "David Riedel's Finding the Hot Spots provides keen insights into the new reality of investing with a global perspective. Internationally diversified investment portfolios reduce risk while enhancing returns, as many American-based individual and institutional investors have discovered in recent years. Riedel succeeds in providing simple, effective tools and strategies." "Finding the Hot Spots simplifies and demystifies international investing and makes non-U.S. markets alluring and accessible . . . a must-read for all individual investors." "Anyone considering investing in emerging markets should begin by reading David Riedel's Finding the Hot Spots. This excellent book explains how to reap the benefits while avoiding the risks of investing in the world's fastest growing economies. Having worked with David in Thailand during the peak of the Bangkok Bubble in the mid-1990s, I believe few people are more qualified to write about this subject than he is." DAVID RIEDEL is founder and President of Riedel Research Group, which provides independent equity research focusing on emerging markets in Asia, Latin America, and Europe. Prior to founding this firm, Riedel worked as an analyst at Salomon Smith Barney in New York and Bangkok. While overseas, he supervised a twelve-person research team covering telecommunications companies and other industries in Southeast Asia. While in New York, he covered business services stocks, including staffing and outsourcing, as well as small-cap growth companies in the automobile and motorsports industries.